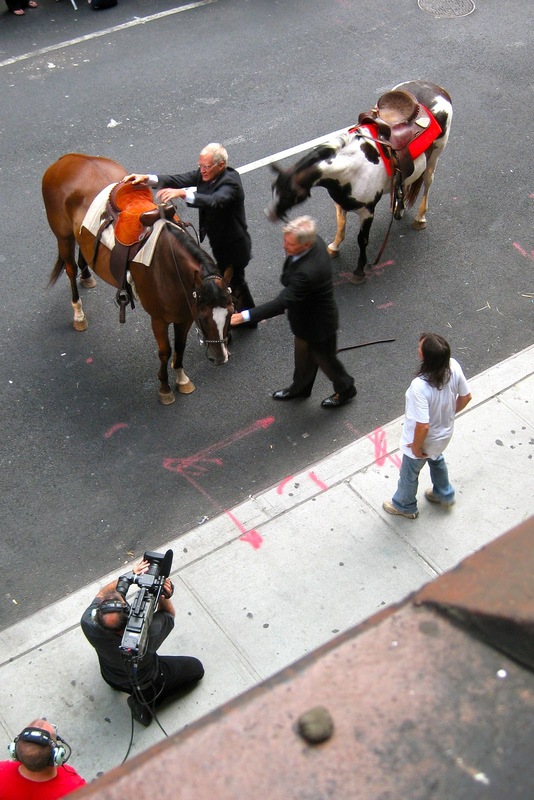 Big stars riding horses in midtown! Exciting! But I had to reassure the gum, "No matter what the horses do, you'll always be 53rd Street's favorite blob of filth." Few know this, but Mr.Ed was a big fan of Double Mint Gum. That's what they stuck on the roof of his mouth to make him "talk." Wait. You're saying Mr.Ed needed encouragement to talk? Never knew he was shy. I thinkk Ed and Wilbur both had Asperger's Syndrome. I wonder if there's ever been a racehorse named Asperger's Syndrome. Looks like the NYC Department of Streets and Steam Vents has marked out a space there in the street for one of those giant steam vents - right in front of the stage door. I wonder what this will do to the arriving and departing celebrities? They don't like getting steamed. Dave Letterman & Harrison Ford take a trip to the famed New York Glue Factory.